Slow Burn Theatre Compnay has grown by leaps and bounds in just a few short years. As they get ready for their summer musical presentation The Wedding Singer, Co-Artistic Directors Matthew Korinko and Patrick Fitzwater talk about the history of Slow Burn and what it takes to run a successful company. 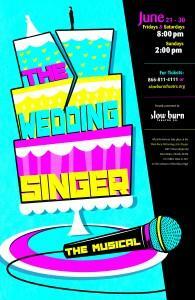 Slow Burn Theatre Company presents The Wedding Singer June 21 - 30. Louis Tyrrell, Artistic Director of the Theatre at Arts Garage in Delray Beach, is passionate about new American plays. This summer, a Thursday night play reading and concert series introduces us to musicals South Florida audiences wouldn't otherwise have a chance to experience. To hear the full interview, visit artsradionetwork.com. The South Florida Science Museum in West Palm Beach was built in 1961, and stayed essentially the same for more than 50 years. All that changes this summer, as we learn from SFSM President Lew Crampton. The Broward Center for the Performing Arts has become an important part of South Florida's cultural landscape. Here's some memories from two people who have long histories with this organization.